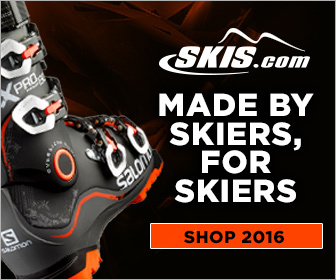 Line Tigersnake Skis 2016 - The new Tigersnake from Line is a great ski for a range of skiers. It can be an entry level twin tip for the skier who is ready to attempt rails, boxes and jumps for the first time, it can be a great all mountain twin for the tween or younger teenager that is ready for his first set of adult skis, and pure freestyle guys love to use the Tigersnake for rails and boxes. Made with both Early Taper and Early Rise the Tigersnake can be very easy to maneuver with minimal pressure applied to the ski. Line's Carbon OllieBand uses tip to tail stringers that will provide you with lots of spring and pop for jumps, tricks, and showing off to that cute girl that is always checking you out in the lift line. Line improves the durability of their skis by making a Fatty Base and Edge that is 30% thicker for crushing boxes, rails or anything you may try sliding on. Not just a pure park ski, the Tigersnake can be used on the groomers as well, with the help of the 5-Cut Sidecut that has five different radius shapes in the shape of the ski that will allow you to make any turn shape you want. The 4D FiberCap Construction has Fiberglass reinforcements wrapped around the core to keep the weight down and responsiveness of the ski up. If you are ready for a well rounded first set of twin tips, the Line Tigersnake is the ski for you.